This Pet Gear “Expedition” large dog stroller allows your dog to walk in and walk out of the pet stroller without you having to lift your large dog. It will take dogs up to 150 lbs. If you have a senior dog or your dog is recovering from surgery this is an excellent alternative to walking. It allows your dog to get out and about even if they’re not up it. You get the zipperless entry feature on this dog stroller. It comes with push button entry so you’re not fumbling with zippers to get your dog in or out. You also get a foot brake on this dog stroller. Your dog can enter the stroller from the front or the back. You don’t have the turn it around for your dog to exit the stroller which is a huge advantage if your dog is older or injured. You get a multi position handle you can adjust up to 40 inches high. The interior of this Pet Gear large dog stroller is 32 L x 22 W x 23 H inches. The overall weight of this pet stroller is 26 lbs. This stroller gives your dog a panoramic view as they’re being wheeled along. The mesh front lets lots of air in but keeps any insects out. The folded down dimensions for this dog stroller are 37 L x 29.5 W x 14 H inches. There are different color options for this dog stroller. If your dog is under 100 lbs there is similar model available from the same brand. The Pet Gear “Excursion” pet stroller is lighter if you need to lift it into a car or up the front stairs of your house. It is also cheaper. The internal dimensions on the “Excursion” are smaller than the “Expedition”. The Excursion measures 27 L x 15.5 W x 20 H inches. This model includes the same non-zip easy locking feature as the Expedition dog stroller. If you need a high quality stroller that you can rely on and your dog is under 100 lbs, this is the best dog stroller for you. The advantages of the Excursion are that it is lighter, smaller and cheaper then the Expedition but it still has all the high quality features you want. This is an expensive dog stroller but it is also the top of the line in pet strollers (you can check the current price here). If you’re looking for the best dog stroller you really can’t go past the DoggyRide Novel Ride Jogger-Stroller. This is a high quality pet stroller that you and your dog will enjoy using for many years. The front wheel can be fixed for jogging so it doesn’t wobble. The enclosure includes mesh panels for your dog to see clearly through the front and sides. This also helps get air in and keep bugs out. The frame is constructed from a light-weight aluminum alloy and the wheel spokes are stainless steel. You get quick release wheels allowing you to put the stroller easily into your vehicle. Included you get a padded front headrest for your dog’s comfort. Also, if you want to purchase it separately you can get a luxury pet mat from the same company which fits the stroller perfectly. It gives your dog extra comfort as well as absorbing road vibration. What are the Interior Dimensions? If you have a large dog it is important to know that your dog will be able to sit down in plenty of room before you decide whether it is the best dog stroller for you. Interior dimensions on this DoggyRide are 31.5 L x 21 W x 25.5 H inches. This is the best dog stroller for dogs up to 110 lbs with a maximum shoulder height of 26 inches. You can also use this large dog stroller to fit several smaller dogs in it at once. You can choose from two color options: red/black or green/grey. This model of DoggyRide stroller weights 35 lbs. It is substantially lighter than the older version making it easier to load into your vehicle. Overall height of the assembled pet stroller is 39″ or 41″ depending on the height of the push handle. Total stroller length is 60 inches. Overall width of the stroller is 30.5 inches to be able to fit through a standard door opening size. When folded flat the stroller dimensions are: 31.5 L x 21 W x 4 H inches. Does it have a brake? Yes, this is one of the best dog stroller choices for safety features. It includes a brake on one wheel only. However, this should be enough to keep the pet stroller stable while you’re loading it. Some owners have lamented that it doesn’t include a second brake on the other wheel but often these same owners have still given the stroller a 5/5 rating because it is such a high quality product. This may be the best dog stroller for you for another reason too. You can remove the wheels and push bar handle and use it as a crate at home or in the car for longer journeys. This is an added feature that you’re unlikely to see on other pet strollers. You could even use it as a dog crate when you’re out camping or in an RV. Who should buy the DoggyRide Novel Ride Jogger-Stroller? If you have a large dog and you want a very stable stroller for fast walking or jogging then this is the best dog stroller for you. 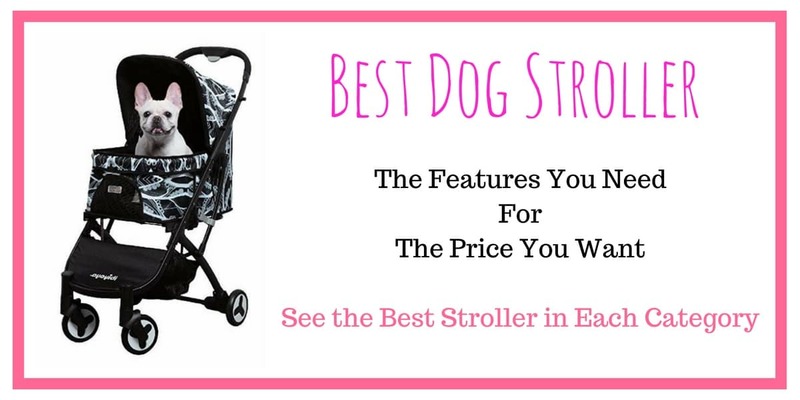 It is also ideal for dog parents wanting to take out multiple dogs in the one stroller. You can also buy a bike conversion set for this stroller if you want to tow this dog stroller behind your bicycle, so it’s ideal for bike riders too. It is expensive so you’ll need to be able to afford it, but if you can, you’ll get many years of enjoyment from it with your dog. If you don’t have a large dog then you don’t need to spend as much to get the best dog jogging stroller for you and your pet. This Pet Gear No-Zip Jogger Dog Stroller can be used for jogging if you insert the front wheel locking pin which comes with it. It includes air tires for a smoother ride. Some pet strollers have wider tires that look like they are inflatable but they are really just plastic and they don’t have the inflatable nozzle located in the spokes. These tires are true inflatable tires. Do be aware that the tire pressure should be at 30 psi. If your tires aren’t inflated properly then the stroller may not ride as smoothly. The 12-inch air tires are quick release if you want to save space when storing. The handle bar is height adjustable to 41.5 inches at the highest. Do I need the No-Zip Feature? In true Pet Gear style, this jogging dog stroller comes with the no-zip feature to let you lift the front canopy to easily put your dog in or out or let your dog socialize without the mesh being down. You don’t get a zipper or mesh window at the back of this stroller. This can be an advantage or disadvantage depending on what you want. If your dog is a larger medium size breed then you may not want him or her to be pushing onto the mesh at the back while sitting down, so this is an advantage. But if you need to load your dog from the back of the stroller you can’t do it with this one, hence a disadvantage. What are the dimensions of the jogging dog stroller? The interior dimensions of this dog stroller are: 28 L x 12.5 W x 22.5 H inches. The total capacity is 70 pounds so there is plenty of room for a medium dog or two small dogs. The overall weight of the stroller itself is 27 lbs. This dog jogging stroller includes the one hand fold system from Pet Gear. This is a huge advantage because you don’t need to take the canopy apart at all to fold it like some of the travel lite dog strollers. This is a good dog stroller for small to medium dogs at around $50. You get bang for your buck and your dog will appreciate getting out and about with you. This stylish dog stroller holds a capacity of 33 lbs maximum. You can fit one small to medium dog or two small dogs in this stroller. There are mesh windows at the front and back to ensure good air flow. And your dog gets a good view. This stroller comes in a choice of colors including a blue plaid option. This pet stroller folds easily with the press of a button on the handle. Folded dimensions are: 32 L x 17 W x 11 H inches. The unfolded dimensions are: 34 L x 18 W x 40 H inches. The stroller weighs 13 lbs. You can load your dog easily using the front zipped opening and the front step. Alternatively you can lift your dog into the stroller through the top zipped canopy. There is plenty of storage under the carriage to treats, water bottles, toys etc. And you get a drink holder on the handle too. You get rear foot brakes on this stroller and a security tether is included in the carriage. Even though this stroller includes the word “jogger” in the name of it, you may not want to rely on it for jogging. City jogging on a smooth surface is probably okay but if you want to do faster jogging or the road surface is not completely smooth you may want to consider the Pet Gear Jogging Dog Stroller shown above which has larger 12-inch air tires. It will provide your dog with a smoother ride if you need to go on trails (also see the all terrain dog stroller shown below). If you have more money to spend then this light weight ibiyaya stroller is really cool. 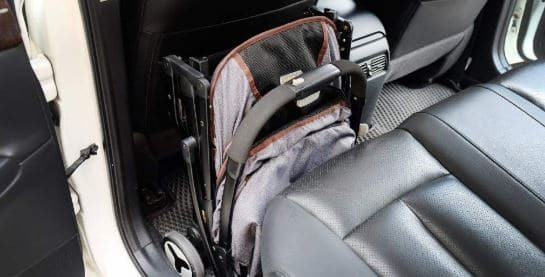 It folds down to be compact enough to store in an airplane overhead compartment or in the footwell of a rear car seat area. This stroller offers convenience as well as a stylish appearance. This is the best dog stroller for anyone who wants to take it with them in a car or on a plane. And if you live in a small apartment it saves space when you need to store it. Folded dimensions are 23.3 L x 17.4 W x 8.7 H inches. The carriage dimensions are 22 L x 13 W x 20.9 H inches. The handle height is 39.5 inches at maximum height. The front two wheels include suspension for a comfort ride. The chassis is shock absorbent and the handle bar is soft to hold. Overall this dog stroller is comfortable for your dog to ride in and for you to walk with. This dog stroller will hold a maximum capacity of 44 lbs. You can use it for one medium size dog or two small dogs. The front mesh window provides air flow and you get a peek-a-boo window to keep an eye on your dog while walking. You can place items like treats or wipes in the pocket. This is a very lightweight dog stroller at only 13 lbs. This makes it perfect for anyone wanting a lighter stroller to lift into a car. It includes a one hand self-standing fold to make it easy to put away. This dog stroller includes a safety tether. This is the best dog stroller for anyone on a budget. It offers great features for the price and you have a choice of 5 colors. This OxGord Paws & Pals Double Dog Stroller provides two separate compartments for your pets. You also get two separate storage compartments for holding treats, toys, water bottles and anything else you want to take with you. This stroller is a very good price for a double pet stroller. You get mesh air vents at the front and back of this stroller and your dogs get a good view from within. Seat belts leashes are included to keep your pets safe. Rear brakes are include on this double dog stroller which you’ll want to use when loading your pets. What are the Dimensions on this Double Dog Stroller? This double pet stroller folds simply. Dimensions when folded flat are: 32 L x 30 W x 12 H inches. Dimensions when this stroller is unfolded: 38 L x 30 W x 26 H inches. The main carriage on each side measures: 23 L x 22 W x 11 H inches. How many Pets can I carry in this Pet Stroller? Weight capacity for the stroller is 30 – 35 lbs per side or 60 lbs total. Small to medium size dogs should fit easily in this double dog stroller. And if you need to fit four small dogs you should be able to do it with this stroller. This is the best dog stroller if you need to keep two pets separated while walking or if you need to carry more than two pets when you go out. This is the best double dog stroller if you’re happy to have your dogs in the same space together. If you have small dogs you can fit 3 dogs in at once. For the price you get a high quality double dog stroller that can hold up to 3 small dogs. This Pet Gear No-Zip Double Pet Stroller includes the No-Zip feature to get your dogs in and out easily through the top canopy. You get air tires for a smooth and shock-free ride. This double pet stroller also includes a plush bolster pad. There are two interior safety tethers for your pets. You get a wider carriage with this double stroller. Both your dogs can get a good view from the front. And with the mesh window on the top you can see your fur babies as you walk. This double dog stroller includes the quick one-hand fold feature. Also the 12-inch wheels are quick release if you want it to store flatter. This pet stroller is a little bit heavier than other Pet Gear strollers. It weighs 32 lbs but it can take up to 90 lbs of pets in it. It includes a rear brake on both the back wheels. The internal dimensions are 27 L x 20 W x 23 H inches. You can see the width is substantially wider at 20 inches, compared to single dog strollers. The handle height goes up to 42 inches. This is one of the taller handle heights in dog strollers so if you’re tall you’ll appreciate it. This pet stroller comes in three different colors including boysenberry shown above. ⇒ Does your dog have mobility issues? Take a look at the best dog ramps for cars here. This entry was posted in Comfort & Mobility on July 7, 2018 by Didi.